“The White House Gets It: Military with Emphasis on Zech. 9-13” from Christian Faith Publishing author B.J. Cline-Woodruff examines history and modern issues from a Biblical perspective. By relying on Spiritual excerpts to explain events and situations, B.J. Cline-Woodruff provides crucial insights. “The White House Gets It: Military with Emphasis on Zech. 9-13”: a study of multiple topics from a Scriptural perspective. “The White House Gets It: Military with Emphasis on Zech. 9-13” is the creation of published author, B.J. Cline-Woodruff, a retired journalist who has become an author. B.J. Cline-Woodruff spent twelve years in college. Four of those years were spent earning a bachelor’s degree in Art at a community college in Columbus, Ohio. Six years were spent at Monument Bible College in Denver, Colorado where she earned a PhD in Biblical Theology. She also had an associate degree in English literature from UCCS in Colorado Springs. From the age of eight, her uncle, who was also her third grade teacher, hired an artist to educate her. Her job was to teach B.J. everything about sculpting in wood and clay as well as painting in oil, acrylic, charcoal, watercolor, ink, and colored pencil. She taught B.J. about the forests that they often took walks in and used for inspiration. It was this mentor who inspired B.J. Cline-Woodruff’s book, “Run with the Bulls.” Walt Whitman, John Greenleaf Whittier, and Edgar Allan Poe are among her favorite literary artists. Published by Christian Faith Publishing, B.J. Cline-Woodruff’s new book is a collection of insightful essays. After a lifetime of education, professional development, and profound religious experiences, author B.J. Cline-Woodruff shares a collection of essays on her many areas of expertise. “The White House Gets It: Military with Emphasis on Zech. 9-13” analyzes a number of topics from a Biblical perspective. By exploring various issues through the lens of Scripture, B.J. Cline-Woodruff reveals the true nature of things like politics and war. View a synopsis of “The White House Gets It: Military with Emphasis on Zech. 9-13” on YouTube. 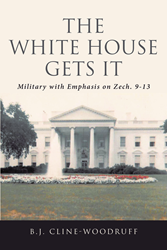 Consumers can purchase “The White House Gets It: Military with Emphasis on Zech. 9-13” at traditional brick & mortar bookstores, or online at Amazon.com, Apple iTunes store, or Barnes and Noble. For additional information or inquiries about “The White House Gets It: Military with Emphasis on Zech. 9-13,” contact the Christian Faith Publishing media department at 866-554-0919.